Not only is every persons eyebrow situation different, but everybody has different skin as well. For that reason, we provide different permanent cosmetic solutions to accommodate a variety of clients. Let’s start with micoblading. This is definitely the current trend that has brought permanent makeup to the forefront more recently. The results are meant to mimic real hair, and can help improve symmetry, shape, and hair density. Please read our first two blogs that go a little more into detail about the process of microblading and how it works. Microblading will not take the place of makeup for a client who likes a more solid filled in look. The beautiful thing about microblading is that it looks natural when you don’t have any makeup on, and you can always add makeup to them when you have a full face on. 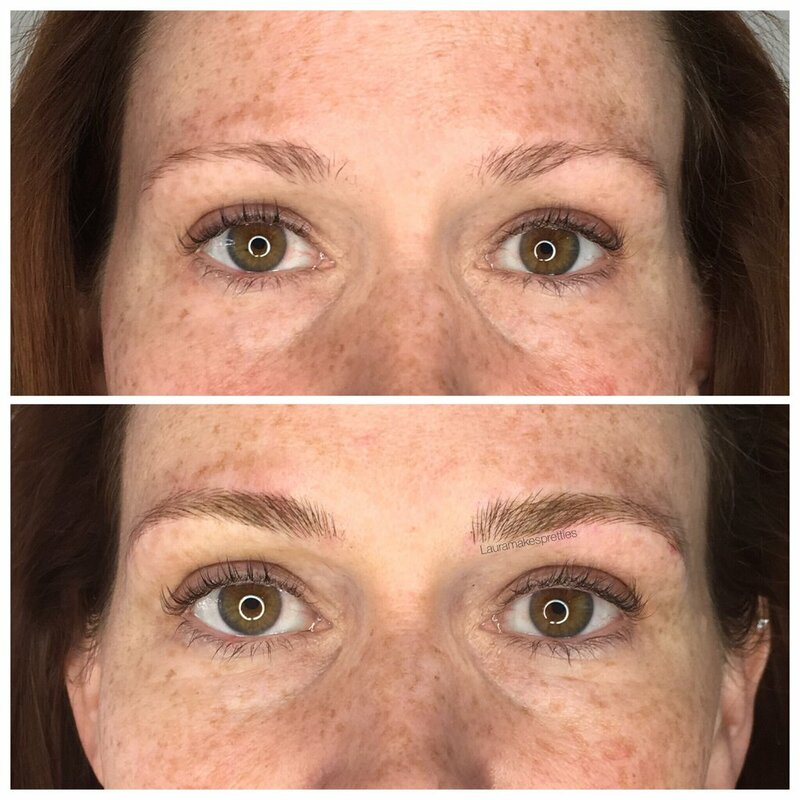 Although microblading can be labeled as “semi permanent,” the results can still last for quite a while and it is important to make an educated decision on getting it done. The healing process is very delicate and certain skin does not take as well to the process as others. Medical conditions, skin type, and other factors come into play. Sometimes aftercare needs to be adjusted for different skin types as well. Here are a few examples of microbladed eyebrows. Next up would be a “combination brow.” There are several reasons as to why we would maybe incorporate some machine work into your eyebrows. 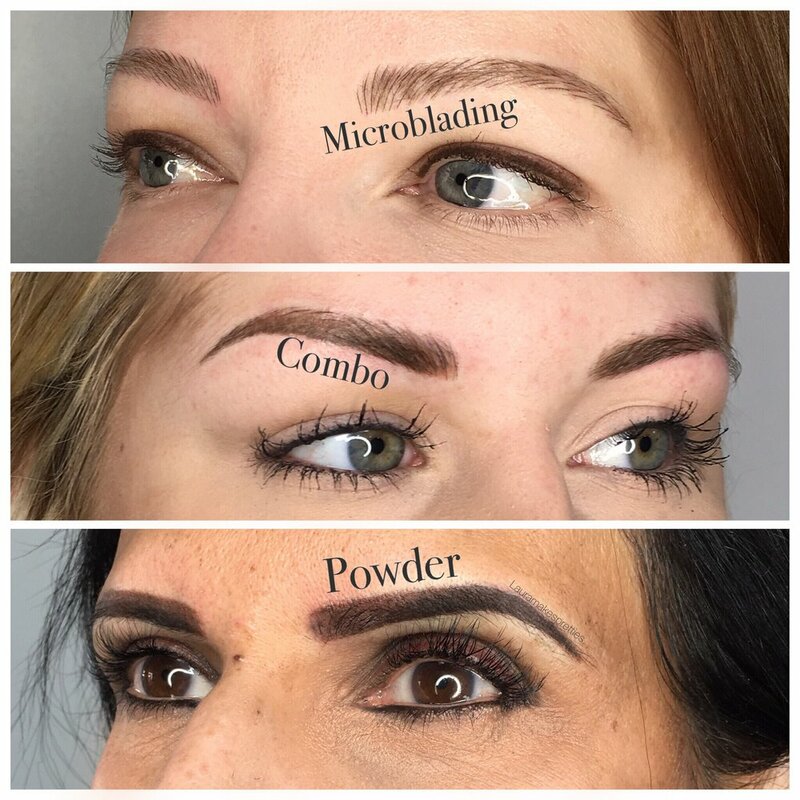 A combination brow can be done by microblading some hair strokes, or doing machine/nano hair strokes with a shading or “powdering” effect with them. If there are areas of your eyebrow with no natural hair growth that you would like filled in, we may decide to add some shading to blend in to where your natural hair starts to grow. If you are someone who has had your eyebrows microbladed by us but decide you want a more filled in look, we can add “powdering,” or shading to your annual touch up for an upcharge. This may eleviate the amount of makeup add to your microblading on a daily basis if you find yourself liking a more filled in eyebrow than just a microblade application. Machine work does last longer than microblading, and some skin tends to accept pigment better with this application. Machine work is a good option for clients who’s skin does not retain or heal microblading as well as others. Here are some examples of a combination eyebrow. Powder brows are done by shading in the desired eyebrow shape with a machine. There are no hair strokes in a powder brow. This is a good option for clients who like a more solid filled in eyebrow, and also very oily complexions who do not retain hair strokes as well. This would also be a way to work with previously tattooed eyebrows that are faded enough for us to consider touching up. 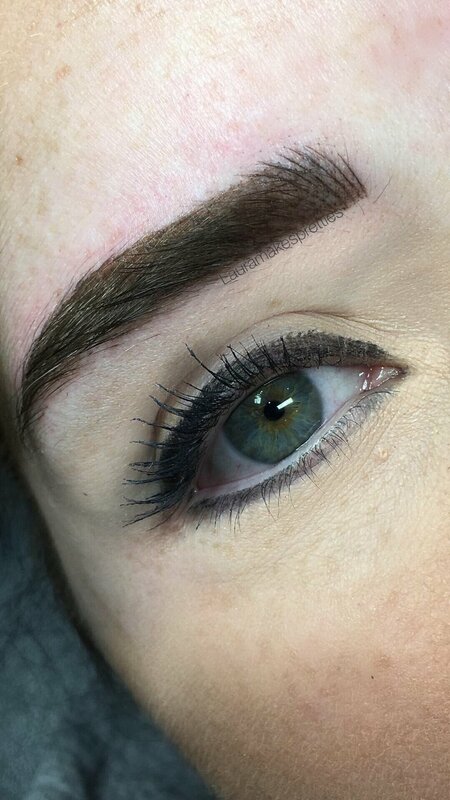 Microblading is not an efficient method to do touch ups on previously tattooed eyebrows, as you will still see the old tattoo through the hair strokes. Here are some powder brow examples. During a consultation we would be able to make a custom recommendation for your eyebrows based on what hair we are working with, your desired results, as well as your skin type. We hope this little blog has given you some insight as to what your different options are, and that hopefully we can find something that works for you!